One of my long-standing pet peeves in the wine industry has to due with wine packaged in massive bottles. The design of these bottles is meant to impress people looking at wines on a retail shelf. My issues with these heavy bottles started while a Sommelier. Pulling one of these beasts off a shelf at a store may make one feel important, but carrying two or three bottles to a table of twenty then serving them is like going to the gym. The reason for those massive bottles is sales—market research has shown that bigger bottles get more attention in stores. Yet most of the wines in the big bottles are focused on restaurant and direct ship markets, two areas where size really is a pain and in the case of direct shipment, more costly and less green. Just to clarify, the big bottles I speak of do not hold more wine, but the same amount (750ml) as a typical bottle. Recently, a bottle of Pahlmeyer Red was open on my kitchen counter. I went to pour a touch only to discover the bottle empty! I couldn’t tell by the weight of the bottle whether it was totally full or empty (talk about disappointment). There are some wonderful bottle designs that I do like. Some are great because of the shape, while others have great labels or closures. Closure is wine-speak for what keeps the wine in the bottle—a real cork, a fake cork, a screw cap, a crown-cap (think beer), a glass-closure. Due to the cost and failure rate of real corks, many producers are using screw caps and other methods of closure. Some screw caps almost look like a normal wine cap with a cork, until you go to open it. And glass closures have the elegance and natural character that make them closest to a real cork. I am not a fan of fake corks (corks made of some synthetic product). They are difficult to remove, close to impossible to put back into the bottle and they don’t seal the wine as well as either a screw cap, a glass closure or a real cork. As for bottle design, there are producers that are beginning to use lighter glass to lighten their carbon footprint and there are bottles of all kinds of shapes and styles. These can be fun and cool, but sometimes offer problems with storage bins in wine cellars. 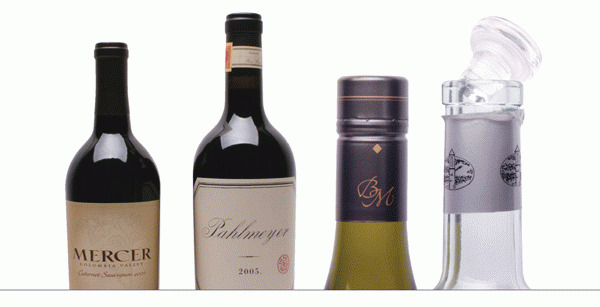 A new trend in wine is having some information about the wine on the back label and even more available at a website. This is great for the curious, but the information can vary greatly from just a tease to way more than even the most wine savvy or curious would want. A winery’s web presence can help enhance their brand awareness and their brand image, so there has been great innovation in that area. Sometimes it helps the brand, sometimes it hurts, but when you find a wine that intrigues you, take a moment to visit their website.